I was provided with free product in exchange for my post. All views are my own, thank you! The Biggest Loser is one of those shows that inspires audiences to make better choices and to get up off the couch and make positive changes in their lives, including where diet is concerned. Since 2006, Jennie-O has influenced contestance with healthier choices, for healthier diets and The Biggest Loser* has just entered into its 17th season! With recipes such as Mini Spice Turkey Meat Loaf and Turkey-Bacon-Burgers, Jennie-O has you covered and with motivational speeches, grit and determination from contestants on The Biggest Loser, I am starting to feel like I'm heading in the right direction already! Jennie-O recipies can contain a lot less fat and help support weight loss through a good exercise and eating plan! As such, there are MANY Biggest Loser-approved recipes, which you can find when visiting the Jennie-O website!. Here is a look at how you can make Jennie-O Turkey-Bacon Burgers, which were put together by Jennie-O and the new host of The Biggest Loser: Bob Harper! Kickstart some healthy eating habits of your own, and cut out some of that unnecessary fat, while still enjoying a great meal - don't they look delicious?! Combine the ground turkey,onion, garlic and pepper*. Form into 10 patties. Ideally, make this mixture at least 8 hours before cooking so that the turkey can marinate with the other ingredients. Freeze any extra formed patties to thaw later. Heat grill to medium-high heat. 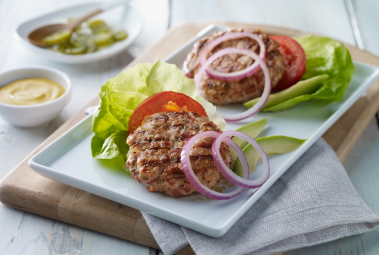 Grill turkey burgers approximately 14 to 16 minutes. Always cook to well-done, 165°F as measured by a meat thermometer. Layer lettuce, tomato, turkey burger and onion. Top with avocado, pickled jalapeño and mustard, if desired. *JENNIE-O® also suggests adding 15 slices of chopped, uncooked JENNIE-O® Turkey Bacon to the meat mixture, which is easier to chop when left in the freezer for 15 minutes or so to make it a little firm. I personally like my turkey burgers on a soft bun with jalapeno peppers and a dab of canola mayo and a slice of tomato, but you can eat them any way you like!! I actually went out and picked up several packs of Jennie-O product yesterday. Bacon AND lean meat were on the menu, so I think I might even make these, again, tonight, myself!! YUM! For more tasty recipes and products available in the Jennie-O range, and Jennie-O's link to The Biggest Loser, check out Jennie-O's website and across social media for more up-to-date info as it comes your way with hashtag #switchtoturkey, today!